Jumping the fence - Griffology...where every paw counts! He sees an animal or something else that he feels compelled to chase. The dog sees a friendly person or dog she'd like to meet. A dog could find it frightening to be left alone in a yard. A dog might learn to associate the yard with anxiety, fear or loneliness. Sometimes dogs can hear things on the other side of the fence and jump over to investigate. It’s very important to work out the underlying cause for the jumping. Knowing why a dog is jumping over a fence is the first step to addressing the issue. Make sure all of your dog’s physical, social and behavioural needs are being met. Is your dog is getting enough daily physical exercise? It’s important to provide daily exercise such as going for a walk and/or visiting a dog park. This also provides your dog with new and interesting smells and environments in which to seek and explore. Are they receiving enough daily attention and social company? Does your dog have environmental enrichment? Does your dog have safe dog toys to play with? If your dog likes to dig, do they have a designated digging area? Do they have food, water and shelter and a comfortable sleeping area? Do they have access to a toilet area? Does your dog suffer from separation anxiety? You should talk to your vet for advice. How long is your dog left on their own? If a dog is left for long periods alone this can lead to boredom and frustration which can then lead to wandering and jumping. It’s important to minimise the time left alone in the yard. Try organising for a dog walk in the middle of the day to break up the time period in the yard. Is your dog desexed? Undesexed dogs are more likely to wander in order to find a mate to breed with so talk to your vet about desexing. If you’re in the yard with your dog it’s unlikely they will try to jump the fence while you’re there as they usually prefer to stay with you. However if your dog looks interested in jumping, catch their attention by calling them or grabbing their favourite toy or tasty food treat. When your dog responds to you and comes towards you, always reward them for this. Continue to reward them when they move away from the fence and come towards you. In addition to ensuring all of your dog’s needs are being met and ruling out other underlying causes for jumping such as separation anxiety or searching for mates to breed with, here are a few suggestions to prevent your dog even being able to jump the fence. Use PVC plastic piping or large rubber tubes, at least 5 to 6 inches in diameter, cut lengthwise down the centre. Place them along the top of your fence. This makes a curved, slippery surface that a dog cannot get a grip on to get over the top of the fence. 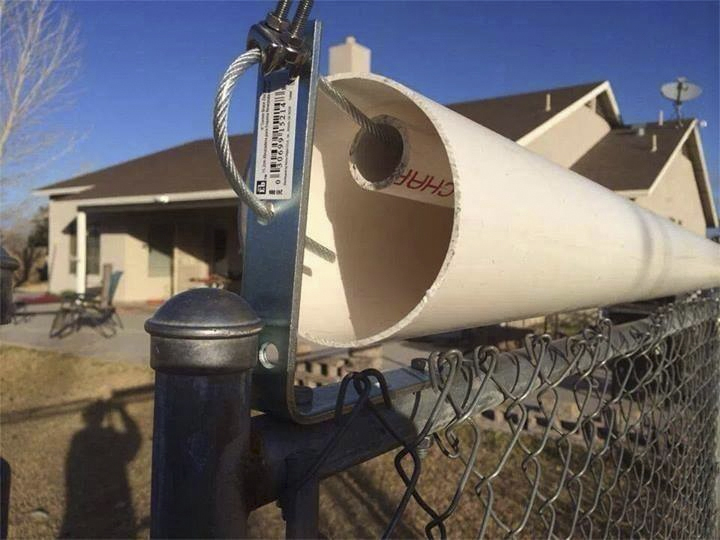 Alternatively, place a small diameter PVC pipe inside a larger diameter pipe and hang these on a cable suspended above the fence to create a ‘roller bar’ which a dog’s paws cannot hold onto.